This Myoko Tours page is updated as more information is available. Please contact us if you have specific requests. A ski holiday can be rough on your body and sometimes you need a rest day to relax. Or the weather isn’t great and you just can’t be bothered going out on the slopes, but you still want to do something interesting. Perhaps you want to take some time off to explore or perhaps there are non-skiers in your party? Well, there’s plenty to do and see in and around Myoko Kogen. In addition to the above there is an option to include a delicious homemade beef stew lunch and a soak in the onsen (hot spring) for an extra ¥2,000. A charter car or van from the local Kogen Taxi company is available ex-Myoko starting at 30,000 (4.5 – 5 hours). Ask your hotel to book this for you. Individual Snow Monkey tours are available from Akakura Onsen for 2017/18 ski season. Available from December through February. Ask your hotel for details. The Myoko Akakura Snow Monkey Liner is available for charter tours for up to 10 people. Departure from Akakura Onsen between 10:00-11:00 am. Tour takes about 4 hours and costs 45,000 yen. Contact us to book. Catch a train to Nagano City and then follow the instructions at this page. Japan Snow Monkey taxi charter (from ￥2,722 per person round trip). Have a hassle-free taxi trip to the snow monkey park from Nagano Station. The cost is 21,500 yen for a regular taxi (4~5 people) or 29,500 yen for a jumbo taxi (~9 people) including transportation to Kanbayashi and back, and stand-by time so you can enjoy the monkeys for an hour. Request a Japan snow monkeys taxi booking here. One day Japan Snow Monkey tour from Nagano Station – organized by JTB. Ideal for single travellers or small groups. Take a day trip to Joetsu, the major city down the road from Myoko toward the Japan Sea. Enjoy a kaitenzushi lunch – sushi on a revolving belt. Take a look at the source of that seafood, the Sea of Japan, or take a trip to the fish market. Check out the scenic temples and shrine area behind Takada Station or walk to Takada Park, with Takada Castle and its moat prominent. Visitors can take a walk along the backstreets and see the ‘gangadori’. All of the houses and shops have extended and joined verandahs to the street front. In old times this was to allow foot access during days of extreme snow which came off the Japan Sea. The Joetsu gangadori are unique and known throughout Japan. Need some shopping therapy? Check the Aeon/Wing Market shopping area. Catch the train for 45 minutes to Kasugayama and spend a day checking out all the local shopping area – recycle shops, onsen, ski shops, sushi train, department stores, cinema and lots of other great stuff! Shopping: Catch the train to Kasugayama (approximately 45 minutes), then walk (approximately 10 minutes) to the shopping area and sushi train. Look for the large bridge across the Seki River. Takada Castle, Temples & Gangadori: Catch the train to Takada (approximately 40 minutes). The temple area is directly behind the station whilst there is a walk (approximately 10 minutes) to Takada Park. You can see probably new gangadori on the way to the park along Honcho or some older style further along (see map below). Sea: Catch the train to Naoetsu (approximately 50 minutes), then walk (approximately 10 minutes) to the coast and aquarium. Get into the Destination Myoko Office at Red Warehouse in Akakura Onsen for a map and more info, download a pamphlet or see a Google map here. Sekiyama Shrine is about 10 minutes walk from Sekiyama Station. Catch a train one stop to Sekiyama then get on the local bus headed for Seki Onsen and Tsubame Onsen. Ask your hotel for schedules. There are about 6 buses a day. Togakushi is situated in the north of Nagano within the Joshinetsu National Park just 45 minutes drive from Myoko Kogen. This volcanic area has an altitude of 1,200m and is located at the foot of the two volcanoes, Togakushi and Iizuna. The village nestles amongst 900 year old cedars and is not only a beautiful place to visit but it’s delicious soba noodles are also famous throughout Japan. Togakushi-jinja (Shrine) stands in the midst of a wood with cedar trees that are over a hundred years old, just at the foot of the precipice of Mt. Togakushi. It consists of three shrines – the lower shrine is Hoko-sha (Treasure of Light), the second Chu-sha (Middle Shrine) and the third Oku-sha (Deep Sanctuary). They were built at intervals of roughly two kilometres (see Togakushi Shrine map). There is also a small reproduction ninja village and school. Catch a train to Nagano (about 40 minutes) then get on the local bus headed for Togakushi (about 60 minutes). See the Togakushi Village page for more access details. Take the train to Nagano City from Myoko-Kogen Station (about 40 minutes), then take the Dentetsu line train to Gondo or Zenkoji stations and walk about 10 minutes. Alternatively get on a bus or just walk – it takes about 20 minutes. With 400 years of history, Matsumoto Castle is a National Treasure that every Japan visitor should see. Formerly called Fukashi Castle, it was a branch castle of the Ogasawara family during the long period of the warring states. It is located in the city of Matsumoto, in Nagano Prefecture and is within easy reach of Myoko. It takes 90-120 minutes to get to Matsumoto from Myoko-Kogen. Matsumoto castle is located only a fifteen minute walk north of Matsumoto station. Togura Kamiyamada Onsen is about 90-120 minutes by train from Myoko Kogen and has approximately 15 active geisha that continue to entertain visitors to the Japan onsen town. Their services can be arranged through your ryokan or via Tyler at Kamesei Ryokan. The geisha entertain with dance and music performances, drinking games and small talk in Japanese. They are usually hired in pairs for 2-hour periods for 18,000 yen per geisha. They are typically called to liven up dinner banquets with lively, colorful conversation and warm hospitality. By request, they can also perform songs and dances as well as engage the guests in parlor games. For performances, the ‘tachikata’ (dancers) are accompanied by the ‘jikata’ (shamisen and taiko players). Minimum of 2 (1 tachikata and 1 jikata) recommended for performances. For guests that can be flexible with their banquet times, geisha entertainment can be arranged for shorter time periods prior to their other engagements for a lower rate, typically a 30-40 minute period starting at 5:30-6:00pm for 10,000 yen per geisha. With this 30-minute show, the geisha will perform some songs such as the area’s traditional love song Kamiyamada Ko-uta, teach the group how to dance to the ‘Tanko-bushi’ (Coal-Miner) or similar song and have the guests join in dancing around the room. Then the geisha will challenge everyone to Konpira Funafuna or other geisha parlor games, followed by time for pictures with the geisha. 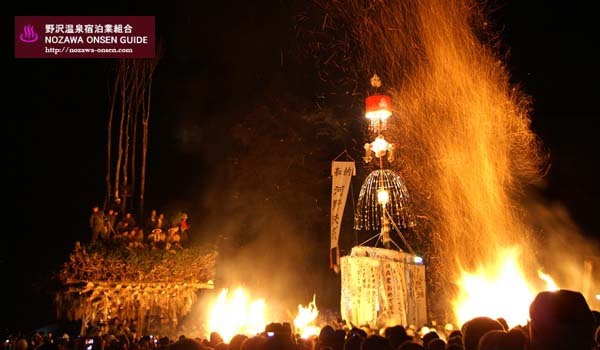 More information about the Nozawa Onsen Fire Festival. The next festival will be on January 15, 2018. Fire and snow always go well and the Nozawa Onsen Fire Festival exemplifies this as one of the three great fire festivals in Japan. Tours leave Akakura Onsen at 6.00pm and return approximately 11.00pm. Contact us to book for 2018. The new Hokiriku Shinkansen offers great new Myoko Day Tours possibilities. Catch the train from Myoko-Kogen Station to the new JoetsuMyoko Station. The trip takes about 30 minutes. From there you may want to consider visits to one of the following. Catch a train to Nagano (about 40 minutes) then get on the shinkansen head for Tokyo (about 20 minutes). Myoko tours T&C coming soon!